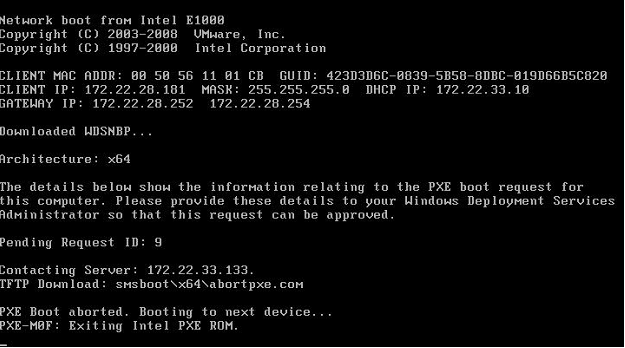 When attempting to PXE boot to your SCCM OS Deployment enviroment you get a ‚PXE Boot aborted‘ error message. Check that the computer has an OS Deployment advertised to it. This can be done by double clicking on the computer object and selecting the ‚Advertisments‘ tab. Confirm that the OS Deployment advertisment is listed. Right click on the computer object and select ‚Clear last PXE advertisment‘. Click ‚OK‘.